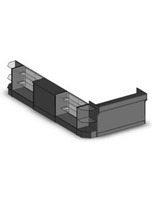 Jewelry Display Cases: 7'-6" x 11'-6"
Jewelry display cases are a staple fixture in a jewelry or department store. 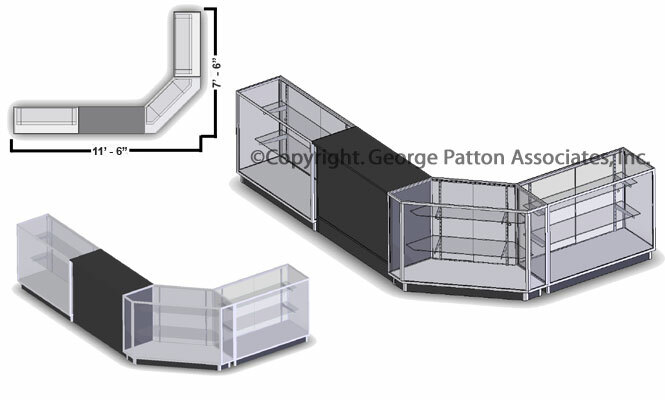 These show cases, jewelry display cases feature a full vision design. Buy jewelry display cases to showcase not only jewelry, but other fine goods such as handbags or perfume. 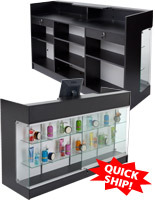 In fact, these full vision displays are the ideal jewelry display cases for expensive items, as they feature locking, sliding doors to keep items within your cases safe. The jewelry display cases, also known as retail cases, feature white doors. This ensures that your jewelry will always be set against a neutral background, so as not to take away from the beauty of the pieces you are offering. Upscale show cases, jewelry display cases are often very pricey. We understand the need for affordable, yet attractive displays so we strive to provide our customers with just that. 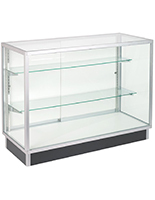 We sell these jewelry display cases with three full vision glass cases and one black counter. This configuration ensures you have plenty of room for both display of products, and storage of business necessities, such as sale slips or ledgers. Preconfigured jewelry display cases, such as jewelry showcases, or upscale store fixtures, are a smart purchase, as all glass surfaces are crafted from tempered glass.